I really loved these pieces they were all done by the same artist. The vibrant colors really bring out a beautiful aesthetic to this piece. There is a lot of movement throughout each piece that are down strategically with different line weights. I was so interested in these pieces that I noted the different materials used including Gesso, Acrilico, Tessuto, actylic charioteer which were some materials I had never heard of and had to look them up! I love learning about different materials and what they can do ,so i found this collection of pieces to be inspirational for me to expand on more materials. These pieces were extremely unique all done by the same artist. The different compositions and the use of realism versus abstract is what really makes these pieces stand out. 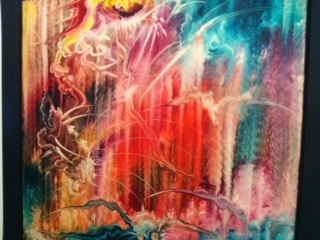 I enjoy looking at all of the different things happening and trying to form some kind of thought as to where the artist was going with the pieces. 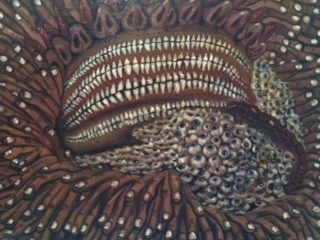 The artist seems to use body parts to create all of the compositions and in my opinion I felt that it was a statement on people being sucked into a superficial world. The reason I believe this is because I read in every piece a "scream for help" in the way that the different body parts are arranged on the paper. I pulled inspiration from this, not so much in how it was done, but the thought process of using realism to create an abstract piece. I felt that the composition and design was so interesting in itself. 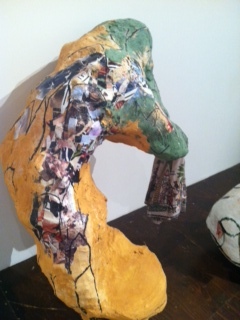 I really liked where the artist went with this sculptural piece. The design is completely geometric, the structure and the wires woven in all create multiple shapes which keep your eye flowing through the piece. I also find it enjoyable that you can see through the piece, because as a viewer it draws me in because it creates more to look at. This piece is not your ordinary "pretty" piece and that is why I like it! I think that in society outside of the art world, people, are ordinarily drawn to what looks very realistic rather than creativity. I, on the other hand look for the creativity in art for example someone could paint a picture that looks so real, but if that's all that is interesting about the piece than I start to loose interest. That is why I really enjoyed this piece because yes, it is a strange looking piece, but when you start to observe it more you see all of the textures created with the collaged on items, the hints of colors splashed in different areas to keep your eyes flowing and the wonderful organic shapes that also make it aesthetically pleasing and I love it! I am so intrigued by all of the wonderful rugged textures within this piece. 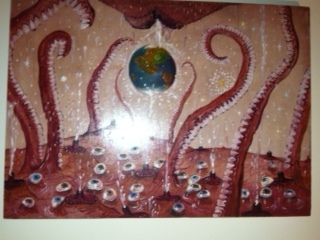 This is another piece that isn't exactly "pretty" but it has a lot of creativity to it. It has sort of a old look to it, as if it was dated back years ago. I also think the textures compliment the rough old look this piece has to it. This piece looks like it took a lot of time. 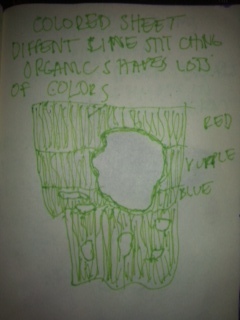 On the second day, unfortunately I forgot my camera to take pictures so I drew little thumbnail sketches to reference. I tried to get the sketches as close to the real thing by adding my own touch. I really enjoyed this piece. I have never thought to use cloth and fabrics as a foundation for a piece of art and I wanted to experiment with that after seeing this piece. 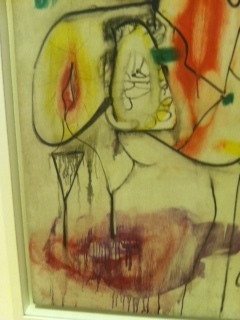 This piece was a cloth with different stiches and paint splotches. I wrote that it had a lot of complementary colors and interesting patterns withing the stitchings which created a nice texture. This piece was HUGE and so wonderful. If it had been smaller I don't think it would have been as effective. This piece inspired me to make HUGE art because it can push a piece even further. This was an enormous wall of mosaics positioned in different ways. 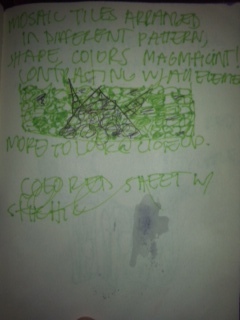 I wrote that it made different patterns, shapes and colors that were magnificent as a whole, and that there was a lot more to look at when you got up close. 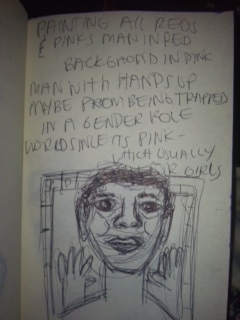 This piece made me put thought into what the artist was trying to convey and I came up with maybe the man in the photo is feeling trapped in a gender roll society, because his hands are up and it is not socially acceptable for men to wear pink. In my art I like to have the viewer make an assumption of my intention and this piece gave me more to think about with that. 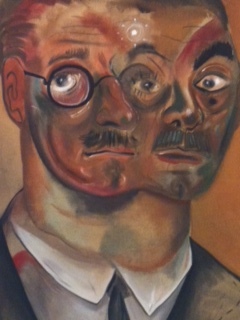 This was a painting of a man in different shades of reds and pinks. it was and interesting compostion and use of good use of monochromatic colorscheme. These forms were really interesting and made me think in a sculptural design it can be really nice to take the form of something light, like balloons, and make them out of heavy material. it creates an interesting concept for me to think about in designing sculptures and I think it was quite clever. Balloon-like forms that were made out of bronze or metal with gold coating. It had a lot of interesting wrinkles and folds and also it had a reflection form the gold coating which added more to the piece. The fact that this Artist did the entire painting with her hands while also having a handicap of being blind was so inspirational. 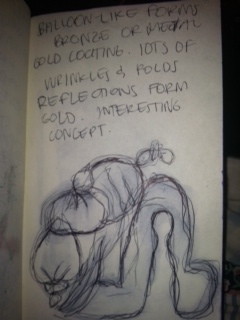 It made me think about trying to incorporate blind contours more often in my pieces of art because it loosens you up. Overall the biennale gave me a lot of good ideas, tools, and inspiration to help me expand as an artist and I was happy to have been able to experience it!! Venice was probably the most beautiful thing I have ever seen... from the beautiful blue water surrounding the city to the artwork. The artwork was just a different story in itself. Everything was so unique and different than I have ever seen!! I noticed a lot of realism VS. abstract and mixed media which is right up my alley...my style of art. I especially liked the Peggy Gugenheim museum, which had all kinds of interesting pieces of art but each room of art seemed to have a different style. 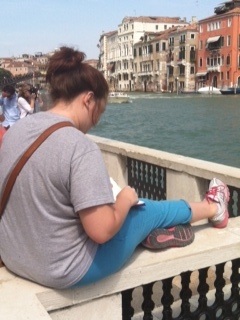 But the highlight of the trip was definitely the Biennale!! Words cannot describe the creativity and amount of work put into the art.. that place really did blow my mind!! 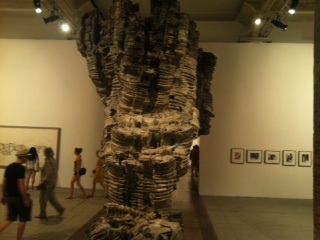 I have visited a couple galleries around SC this summer and nothing compared to the stuff that was in the Biennale. Just by going to the Biennale I feel that it gave me a whole new perspective on what you can things more than I could have ever imagined. I can definitely say I got a lot of great ideas and inspiration!!!!! 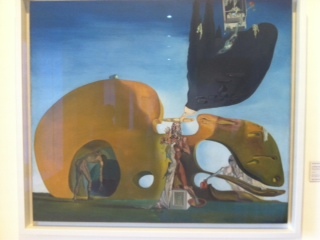 This reminded me of a Salvador Dali, which is one of my favorite artist!!! I LOVED this, it reminded me a lot of my own style. Me sketching outside of the gugenhiem museum with a beautiful view!! This was so funny to me because I didn't even notice all of that was body parts until I started looking closer and I just kept seeing more and more details in the drawing. 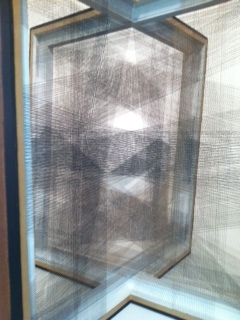 I had to look at this piece more than once because it was so cool! I can't get over how cool this is I tried to figure out what the artist used then I had to give up and read the name tag. It is just incredible!! 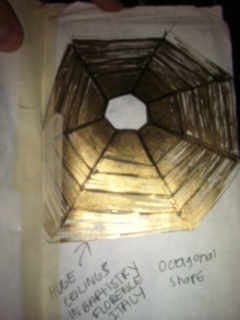 Just thought the contrats between real shinny metal to fabric material. Pretty Cool! 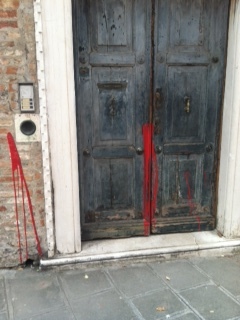 This may sound weird, but this door was outside of the biennale, but I felt like it could be a work of art! I was immediately drawn to it, and it gave me an idea for the projects we had to do! When we arrived in Florence I was so relieved!! Everything was so calm and peaceful. 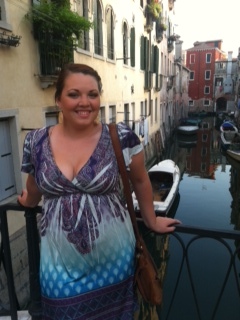 The people were so much nicer and cooperative and the food felt like real Italian food. Every thing was very relaxed and the city itself was very clean and pristine, even the designs on the buildings and cathedrals. 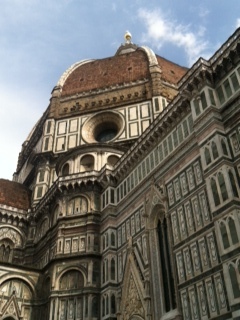 One thing I found interesting was the Duomo. You can see it everywhere you go and they say that if you get lost as long as you can see it, you will be able to find your way. As a tourist I found that to be a really interesting tidbit. 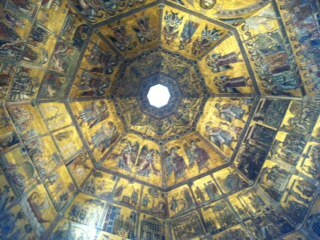 This was the ceiling of a cathedral we went in I was told to look up and that is what I saw!! we visited some museums and galleries, but overall I had a pretty relaxed time there, it was my favorite of the three places. We saw the Spanish steps which are a pain to walk, but they are gorgeous and I admired whatever it was they were made out of it, it had some funky pattern and textures and they were slick. We also saw the THE STATUE OF DAVID...what a sight!! It was more than two times the size of an actual human being, but all of the proportions where perfect.. it was hard to believe. FOOOOOOD!! These were some of the best meals I had the whole trip, I thought I should Share. 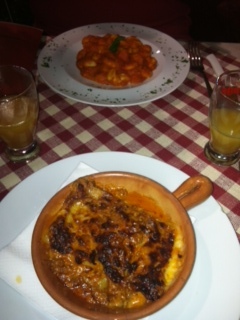 Lasagna and the other was gnocchi I tasted both and they were quite delicious!!! 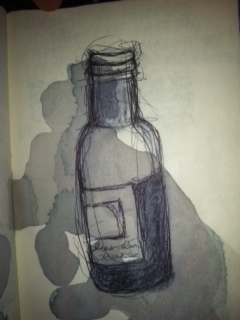 Can't forget the main part of the meal.. WINE... this was just a rough sketch of a wine bottle and I actually stained the paper with a little wine.. I thought it came out pretty cool, so I thought i'd share! Travel notes, sketches & photographs of ROME!! I was Exhausted when I got off the plane and didn't know how I was going to be able to start a whole day. When we arrived we set our stuff down and went for lunch. that was a disaster, because every place required cash only and I only brought a credit card, an American express at that. I quickly found that the American express doesn't work ANYWHERE IN ITALY. AHHHH. I quickly came up with a solution and started the day ..WALKING EVERYWHERE HOURS ON END. We walked so much the entire time that we were there that my feet and legs were swollen and really sore...BUT.. We did get to see some pretty cool stuff!! We first saw the Coliseum which I noted: Very BIG and the area around was so old and dirty looking and the coliseum was too, but old and dirty can be magnificent and in this case it was! I noticed all of the wonderful textures and shapes cut within the arcs and "windows"
This is the Coliseum and underneath is a little sketch I did. We also visited the Vatican in Rome and I was extremely overwhelmed at the enormous place and all of the detail put in it, the wonderful detail!! The ceiling was so high I could barely capture the whole thing. I noticed in the churches there is a lot of gold leaf in the art. That was me dipping my hands in the holy water at the Vatican.. check out the detail in the angel! Some Views of the CEILING in the Vatican!!! We also visited the Vatican museum, which had the Sisteen Chapel in it. The museum was so crowded and huge that we tried to find the exit and ended up in the room where the Sisteen Chapel is..haha.. Unfortunately we weren't able to take any pictures..:(!!! It was such a BEAUTY! Everytime I looked I saw something different. 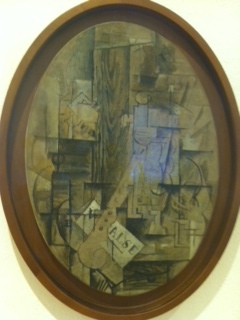 There were tons of paintings of different people and the detail was Emaculate!! Especially knowing that Michelangelo did this while laying on his back.. you really have to admire the talent after seeing it!! 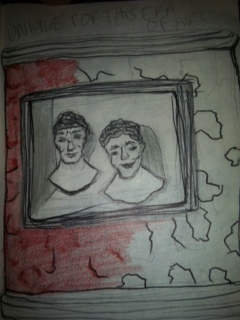 A sketch I did in a gallery we visited in Rome. Some of the art had cats which I think were sacred to them and they add human- like qualities to the sculptures. 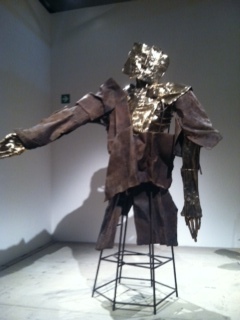 I added some gold metallic and tried to modernize the overall look of those type sculptures. 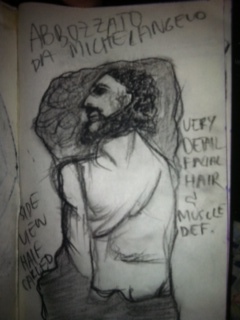 Another Sketch I did in a museum. This was a sculpture that was in a corner. I chose to mimic the style by crinkling the paper and uses graphite and gold metallic to make the background. This was just something cool I saw while walking around. I loved all of the sculptures and I thought this one was particularly unique because in had detail in the face but the rest was very minimal detail which just makes a interesting contrast. Some GOOD FOOD! The top was Mozzarella and Pruisetta and I thought it was so wonderful! 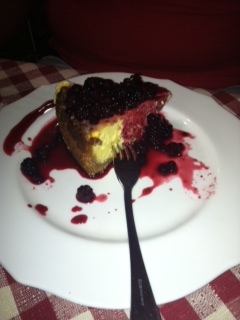 Underneath was Fresh strawberries and melt in your mouth Fresh Whipped cream, and it definitely melted in my mouth!! Although I saw a lot of BEAUTIFUL pieces of art aged back in history, my overall view of Rome was not good. It was crowded and chaotic with rude people and a copius amount of in-your-face Beggars that were surrounded by the famous art and also a lot of pit pockets. The streets were dirty and so were the people. I felt that it was unenjoyable to view all of the artwork surrounded by such filth and greed! shape with the pear. The two pairing together harmonize well together. Each face on the clock appears to have a different emotion on the face, which makes me want to know why. I think the artist intended to display self image in this unique way. The reason I like this piece is because of its uniqueness in a sculptural aspect. I assume it is functional and is displayed in a creative way. 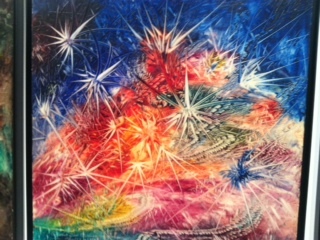 With all of the different elements added it creates a narrative, which creates some thought to the viewer. 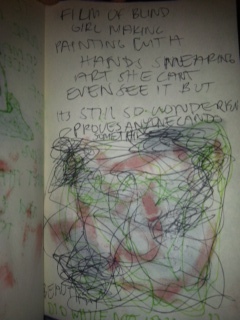 It keeps the attention of the viewer because you want to examine every aspect, to make a conclusion about the intent. flat bars which is not what you want in a 3D element. used in a less dependent way. pieces and make it more clear to the viewer. which adds some variety to the piece as a whole. it is a bold piece. monotonous and could use some depth. ·John bock- A large board that you can actually go inside and see a maget in a jar. this artist to go further with what’s inside. or some other element tied in. is interesting in that you don’t know exactly what was used. The texture adds a lot to this piece and was executed well. texures and colors, but it could be a bit more harmonized. the stitching is a cool element added. being displayed on the projection, but I’m not sure of the importance. to maybe neutralize some of the chaos or tone it down some. color that accentuates the piece. which probably has a purpose, but why? they contrast with the rest and it works. made are not enough to leave it as is. low-key on the wall with such a busy background, it is effective. there is a lot to look at and I admire the detail. ·Christopher William- I believe this piece is a photograph. · Katrin Sigurdardottir- 3D platform. a more creative way, I don’t think it is bold enough to stand alone. 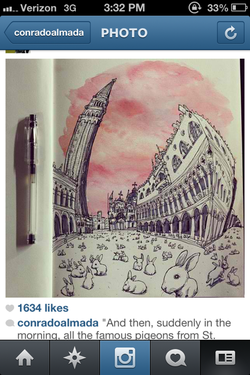 I found this on instagram and I thought it was a unique way to display the St. Marks square in Venice. 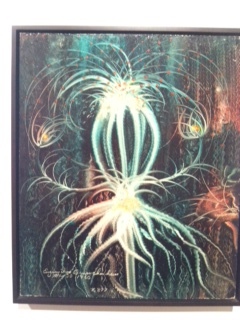 The artist's name is Conrado Almada. It inspired me because it wasn't just a regular painting or drawing of the city, it was much more interesting. I'm so excited only 19 more days until we leave :)!!! I'm Christine. I am a very proud art major and soon to be an artist with a degree!! My style is experimenting and trying to recreate things with textures and 3-d elements. 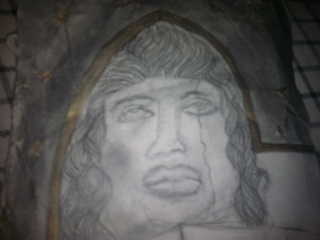 Sky is the Limit with my art, you never know what your going to get!